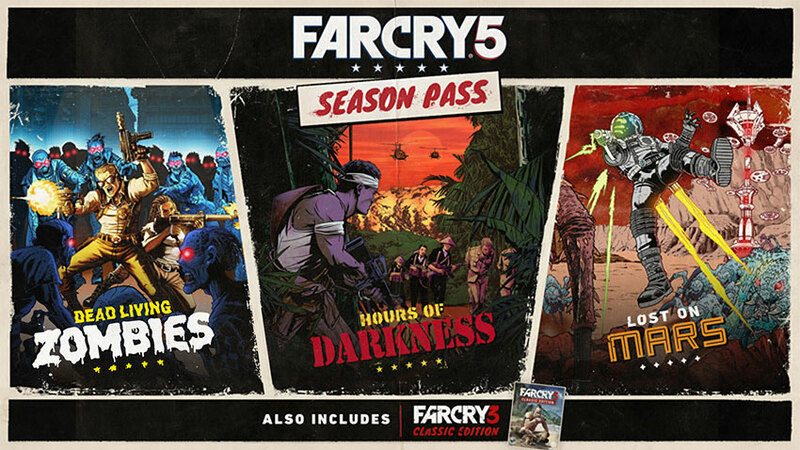 Take your FAR CRY® 5 experience beyond Hope County with the Far Cry® 5 Season Pass. You’ll go on a ride through three new uncanny adventures, and even get the chance to meet an old friend on Rook Island! Wendell Redler is more than just a Hope County resident, he’s a veteran soldier of the Vietnam War. Listen to him recount his glory days, as you travel back in time to war-torn Vietnam to take down Viet-Cong. Trapped behind enemy lines, will you be able to rescue your squad mates and evacuate to safety? Nick Rye the “King of the Skies” is ready to go –literally - above and beyond, to discover uncharted territories. Once you’re stranded on the red planet, your mission is simple: stop the Martian Arachnid invasion and get back home safely. B-movie director Guy Marvel is destined to be the next big thing – just ask him. Join him in 7 hilarious scenarios to take on hordes and hordes of undead zombies. As a bonus, you’ll also get FAR CRY® 3 Classic Edition – travel to Rook Island in the solo campaign of 2012’s best rated shooter! PC players who purchase the season pass or Far Cry 5 Gold Edition will receive the full version of Far Cry® 3. The easiest way to enjoy this triple-feature is by picking up FAR CRY® 5 Gold Edition, which includes the Season Pass. Far Cry®5 is now available on PlayStation®4, Xbox One and PC.